Organised by: Organised by Mum executed by Mum and Dad! Invitation: The party was very last minute this year so we had to create a little something in Powerpoint and send out via e-mail! I used a very cute photo of Accalia holding her favourite Bubba and Bear. Cake: Doll cake made by Mum. Once again the guys at the Lane Cove Toy Library located on Tambourine Bay Rd, Lane Cove, NSW helped me out with tin hire. 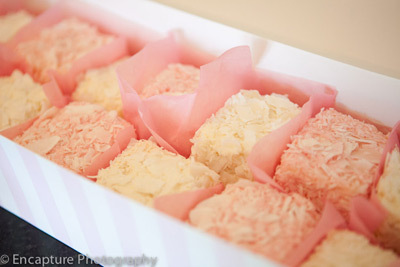 Party food: Big thank you to My little Cupcake, Neutral Bay, NSW. They are absolute life-savers. I called them on the Wednesday before the party and they were happy to help me out. 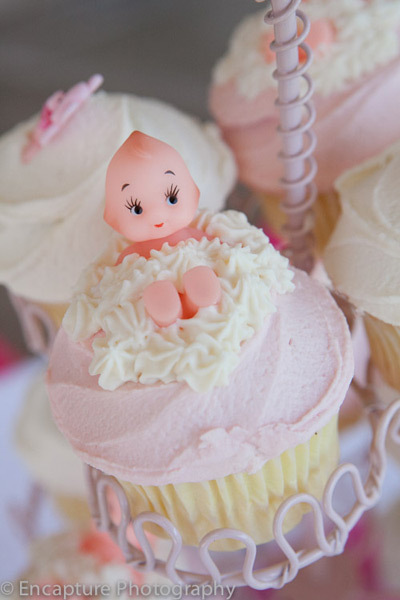 I ordered cupcakes with bubbas and bears - they looked amazing and were perfect for the theme. 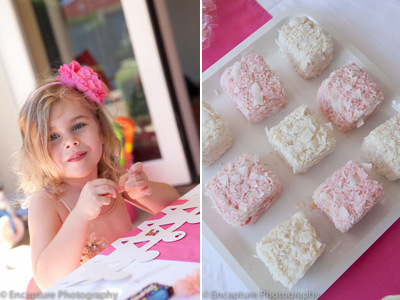 I also got carried away and ordered some delicious pink and white lamingtons - a hit with both the kids and adults. Whilst in the store I also found some wonderful marshmellow bags for $2 each which not only looked amazing but were a delicious hit with the kids too. A visit to the store is well worth it. The staff are fabulous, very friendly and help you carry all of your goodies to the car! 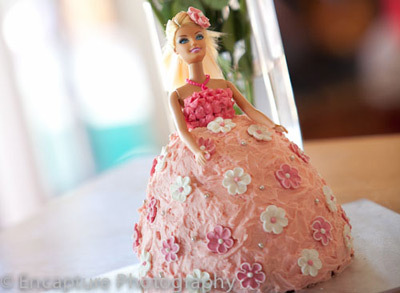 Aside from the wonderful and very tasty cakes and cookies that they have on offer they also sell party decorations, trinkets, gifts, table cloths, pop corn boxes, ice cream buckets, food covers, cupcake stands, paper decorations and the list goes on. Fruit and marshmellow skewers were also a big favourite. I found some cute plastic skewers at Queen Bee Balloon and Party Shop in Rozelle, NSW, and threaded some strawberries, grapes and marshmellows onto them. 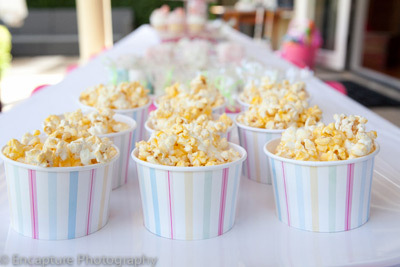 I popped some yummy popcorn and put it into small paper cups (typically used for ice cream). I found these to be much better then the actual popcorn boxes available as they are a much better size for the little ones. Decorations: Table and Chairs all sourced from Munchkin Tables. They are very accommodating and organised for everything to be dropped off and picked up. 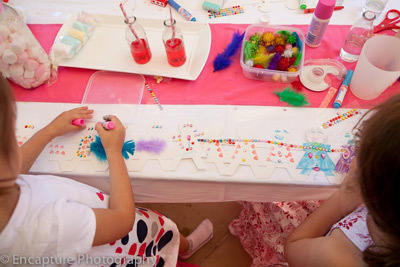 We strung up paper Ball Lantern Decorations (pink and white polka dot). We have had these for years and re-use them all the time. I got these from the Queen Bee Balloon and Party Shop. I used pink Pom Pom Garlands (Martha Stewart) to create a magical entrance into the Bubba and Bear's tea room (our lounge room). They were sourced from a wonderful website Pink Frosting. 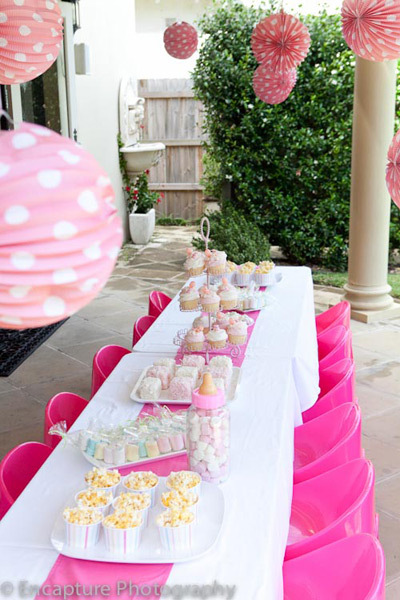 Pink polka dot and pink striped paper plates, cups, straws and napkins were all from Pink Frosting and the Donna Hay Store in Woollahra, NSW. Pink Helium Balloons from the Lane Cove Toy Library. I ordered them Saturday morning and they were ready for pick up at 11am - very helpful! 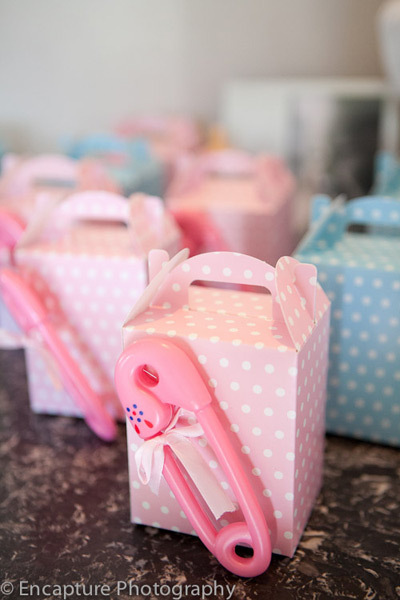 Party boxes in pink and white polka dot and blue and white polka dot were also sourced from Pink Frosting. I attached an oversized pink plastic safety pin to the front of each one. I found those at The Party People Party shop in Drummoyne, NSW. 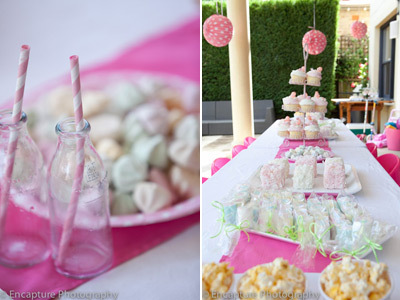 I searched everywhere to find miniature toy baby bottles that I could fill with lollies to put into the party bags. I finally found them on a great little website called Once Upon A Party. I ordered them on the Wednesday before the party and Lisa kindly arranged for them to be expressed posted to me from Bundaberg. I got them in Sydney on the Thursday. I was so grateful. 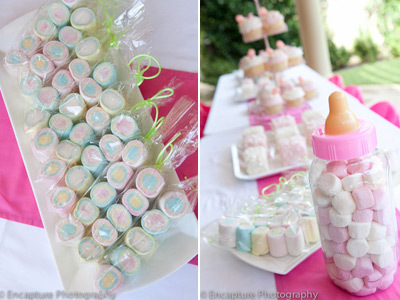 An oversized baby bottle filled with Marshmellows was used as a table centrepiece. The bottle was sourced from The Party People Party shop in Drummoyne, NSW. For the kids' drinks, I purchased an Italian brand of peach puree (six back of mini glass bottles for $4 per pack) from Woolworths. 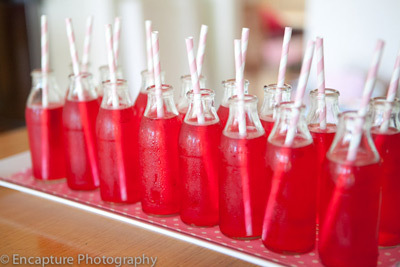 I used the peach puree to make bellinis for the adults and poured red cordial into the bottles for the children. The bottles were a great size for the kids. Games/activities: We kept it very simple this year. The kids played Pin the Dummy on the Baby (sourced from The Party People Party shop in Drummoyne, NSW) and Pass the Baby Bottle (slight variation on Pass The Parcel). 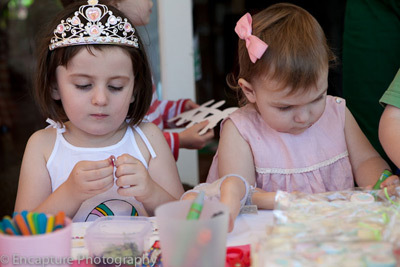 We also set up a craft activity decorating paper dolls with all sorts of crafty goodies including stickers, pipecleaners and self-adhesive jewels (all sourced from the local $2 shop). It was a real hit with the children. Tips: I did not make the same mistake as last year - I baked the cake well in advance the day before with plenty of time to cool so all I had to do was ice it once the kids were in bed. I managed to be in bed by 10pm the night before the party - beats 2am the same time last year! Something special: Turning our lounge room into a Bubbas and Bears Tea Party room was very special for Accalia and the look on her face when she saw it was priceless. 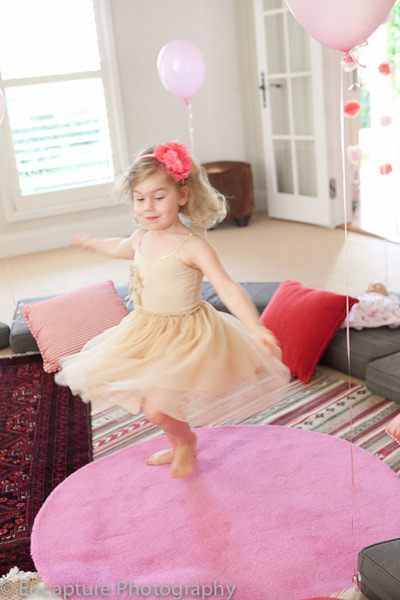 We used a number of rugs and cushions to do this and tied a helium balloon to each cushion for added effect. Oh this is awesome, what a lucky girl!